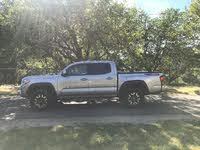 Looking for a New Toyota Tundra in your area? CarGurus has 1,302 nationwide Toyota Tundra dealers with 40,756 new car listings. The current Toyota Tundra debuted in 2014, although the basic design of this version of the full-size pickup has been around since 2007. For 2018, the Tundra gets some styling updates as well as an exciting new TRD Sport trim that adds both styling cues and performance upgrades. 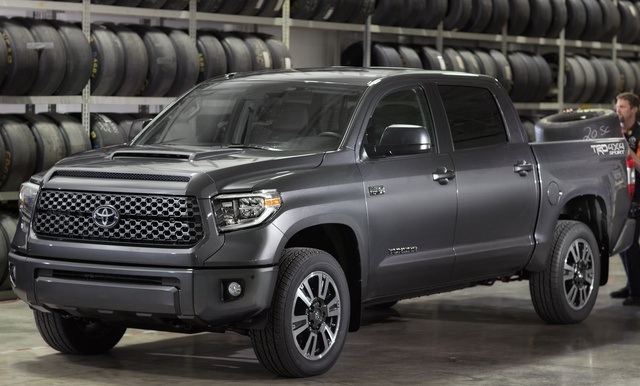 Certain trims receive updated mesh grilles, while a new billet-style grille will grace the Limited trim as well as the 1794 Edition—a Western-themed trim named after the founding year of the oldest cattle ranch in Texas, from which Toyota purchased land for the Tundra assembly plant. Limited, Platinum, and 1794 Edition trims also now come with LED headlights, daytime running lights, and fog lights. The all-new Tundra TRD Sport trim is distinguished by a body-color mirrors, bumpers, and hood scoop as well as silver 20-inch alloy wheels, smoked chrome headlight bezels, a body-color surround for the mesh grille, and TRD Sport graphics. The interior boasts TRD Sport floor mats and a TRD shift knob. Exterior paint choices for the TRD Sport trim include Super White, Magnetic Gray, Midnight Black Pearl, Blazing Blue Pearl, and Barcelona Red Metallic. Base Tundras will be equipped with the 4.6-liter V8 engine with an output of 310 hp and 327 lb-ft of torque, while upper trims (including the new TRD Sport) get the 5.7-liter iForce V8, rated at 381 hp and 401 lb-ft. The Tundra is available in both rear-wheel (RWD) and 4-wheel drive (4WD). Depending on engine, cab size, bed length, and drivetrain choice, the Tundra can haul between 1,400 and 2,080 pounds of payload or tow between 6,400 and 10,500 pounds. For comparison, rivals from the Big Three American manufacturers offer up to 12,000 pounds of towing capacity. It’s also worth noting that the Big Three also offer base V6s in their big pickups with similar performance and better fuel economy than the Tundra’s smaller V8. When outfitted with the 4.6-liter engine, the Tundra is rated at 15 mpg city, 19 highway, and 16 combined with RWD and 14, 18, and 16 with 4WD. The 5.7-liter engine, meanwhile, will get figures of 13, 18, and 15 with RWD or 13, 17, and 15 with 4WD. The new TRD Sport trim doesn’t receive a power boost, but it isn’t just a flashy appearance package, either. It adds TRD-tuned Bilstein shocks as well as anti-roll bars at both the front and rear. In addition to the engine and drivetrain options, Tundra buyers can select from several body styles—the Regular Cab with a long 8.1-ft bed, the Double Cab with rear-hinged doors and either a 6.5-ft or 8.1-ft bed, and the CrewMax with a 5.5-ft bed. Available trims include the SR, SR5, Limited, Platinum, 1795 Edition, TRD Pro, and the all-new TRD Sport. The CrewMax configuration comes standard on the Platinum and 1794 Edition trims. On the interior, the controls for the Tundra are well laid out and easy to operate, and the higher trim levels offer a truly premium-feeling space. The center console is large enough to hold a laptop, and some Tundra models get extra storage space under the seats. The base SR trim comes with smartphone connectivity, a 6.1-inch touchscreen, a USB port, Bluetooth capability, and voice-recognition functions. Next up, the SR5 trim adds a 7.0-inch touchscreen and is available with a TRD Off Road package, while the Limited trim gets leather upholstery, heated power-adjustable front seats, navigation, and dual-zone climate control. The Platinum trim receives parking sensors, front-seat ventilation, a 12-speaker sound system, a moonroof, and blind-spot monitoring with rear cross-traffic alert. The Western-themed 1794 Edition adds mainly appearance upgrades such as wood-style trim, and the TRD Pro trim gets performance items like a dual exhaust and Bilstein shocks as well as unique interior and exterior styling. Toyota has added the Toyota Safety Sense-P suite of convenience and safety features as standard equipment for the 2018 Tundra, featuring lane-departure warning, a pre-collision system with pedestrian detection, automatic high beams, and radar-based adaptive cruise control. The 2017 model received a 4-star overall rating from the National Highway Traffic Safety Administration (NHTSA), while the Insurance Institute for Highway Safety (IIHS) gave it top Good scores for most tests and an Acceptable rating in the tough small-overlap test. The Tundra is vastly outsold by its American rivals, and it’s likely going to be the same story with this only slightly revised 2018 model. Trucks from the Big Three outperform the Tundra in most areas that really count for pickup buyers, but the styling changes and the new TRD Sport trim should at least keep the Tundra a relevant choice until it can get a more significant refresh. What's your take on the 2018 Toyota Tundra? Guru9GFC1 still lacking features like No proximity key yet, probably still no lane changing turn signal and a need for better mileage otherwise great truck. Have you driven a 2018 Toyota Tundra? Enter your zip to see incentives for a new Tundra in your area. Retiring, Want To Buy New Truck And Trailer.